Friday, Sept. 28, from 2-3pm, starting at the Annenberg Auditorium in the Snite Museum of Art and ending at the Grotto. 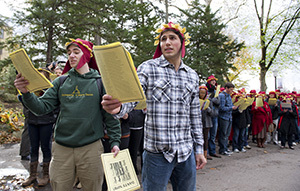 Join the Center for Italian Studies for its annual Dante Now! event, dedicated to performing and understanding Dante’s Divine Comedy. This year Professor Christian Moevs will kick off the event with an illustrated public talk that will be broadcast live to participants at Notre Dame’s Global Gateway in Rome.